Tracing the history of modern sport from its origins in the burgeoning capitalist economy of mid-18th century England to the globalised corporate sport of today, the book argues that, far from the purity of sport being "corrupted" by capitalism, modern sport is as much a product of capitalism as the factory, the stock exchange and the unemployment line. Based on original sources, the book explains how sport has been shaped and moulded by the major political and economic events of the past two centuries, such as the French Revolution, the rise of modern nationalism and imperialism, the Russian Revolution, the Cold War and the imposition of the neoliberal agenda in the last decades of the 20th century. 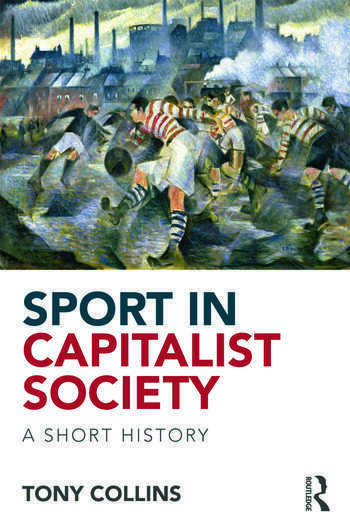 It highlights the symbiotic relationship between the media and sport, from the simultaneous emergence of print capitalism and modern sport in Georgian England to the rise of Rupert Murdoch’s global satellite television empire in the 21st century, and for the first time it explores the alternative, revolutionary models of sport in the early 20th century. Sport in a Capitalist Society is the first sustained attempt to explain the emergence of modern sport around the world as an integral part of the globalisation of capitalism. It is essential reading for anybody with an interest in the history or sociology of sport, or the social and cultural history of the modern world. In the 1920s and 1930s hundreds of thousands of working-class men and women across Europe watched and participated in sport. International competitions were organised with the express intention of undermining national rivalries. Women took place in athletic contests free from the shackles of discrimination. In Frankfurt, Vienna and Antwerp, tens of thousands gathered for huge sporting festivals that could attract more spectators and athletes than the Olympic Games. But these activities were not organised by commercial entrepreneurs or moralistic educationalists. This was a sporting culture based on socialism and the labour movement that sought to provide an alternative to the nationalism, male chauvinism and hyper-competition of the commercial and amateur models of sport. The rise of the workers’ sport movement in Europe was inspired by the growth of the socialist and the trade union movements, and spurred by the lack of sports facilities available to working-class people. The German Social Democratic Party (SPD), as with almost everything else in the pre-1914 European workers’ movement, provided the model for others to follow. The German workers’ sport movement evolved from the left-wing of the Turner movement. As a result of the failed democratic revolution of 1848, the Turner had split into a constitutional monarchist wing, backed by Friedrich Jahn, and a radical democratic wing. Many of the radicals emigrated to the United States. By the 1890s those who identified with Jahn had become increasingly right-wing and anti-Semitic, having the replaced liberalnational flag of black, red and gold with the imperial flag of black, red and white. The growth of the SPD, which had been founded in 1863 and legalised in 1890, inspired the creation of the Arbeiter Turn-und Sportbund (ATSB, Workers’ Turner League) in 1893. By 1900 it had 37,000 members, which increased to 153,000 by 1910. You can download the full excerpt HERE (PDF), or read it on screen below.